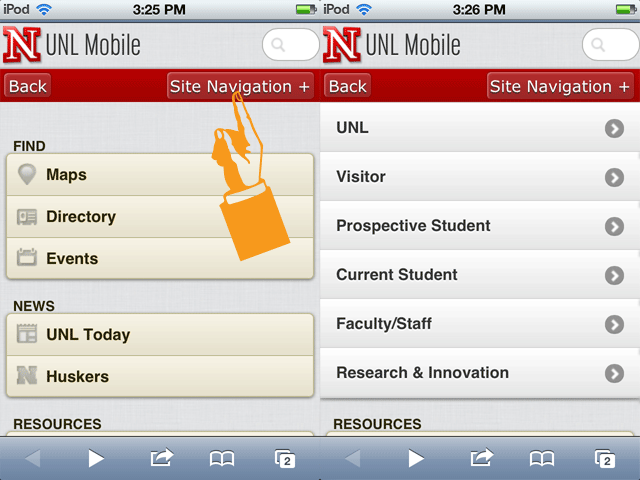 Beyond the Responsive Homepage in #highered: UNL and some? The past 12 months have been marked by a rising interest for responsive web design techniques in higher education. Last year at the #heweb11 conference in Austin the focus was on mobile. While Brett Pollack (UCSD) and Nathan Gerber (UVU) mentioned RWD in their presentations, RWD was still perceived as a small part of the solution. Looking at the schedules of the top 2012 web conferences in higher education (including the upcoming heweb12 in Milwaukee in a few days), it is clear that RWD has now moved front and center. Lately, I’ve been getting questions on the best way to tackle the “responsive challenge” beyond the homepage. In the virtual reunion Stewart Foss, the instructor of our 4-week online course on responsive web design for higher ed, led for his students last month, he presented, among other things, one of these “content” pages, a project Tatjana Salcedo (UVM) completed in only 4 weeks as part of the course. Here’s a 1-minute video excerpt of what he said about it. Many other good examples of content pages can be found on the University of Nebraska-Lincoln (UNL) website. 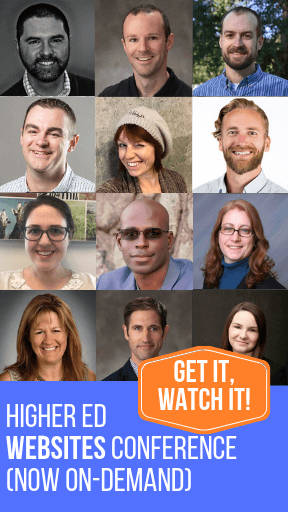 As Seth Meranda will explain in his presentation on the topic at the High Ed Web conference (Oct 9), the UNL Web Developer Network rolled out last March a site-wide initiative to go responsive at the institutional level. They provided resources and templates to all the people managing UNL websites and got 500,000 pages redesigned AND responsive in a record time! What’s really surprising is the fact that UNL homepage was still NOT responsive at the time of this writing as you can see below. Seth Meranda confirmed that the RWD homepage should finally be released by the end of this week. UPDATE Oct 3, 2012: it’s now live! How about that as a different way of doing things, UNL? Seth explained in a Twitter direct message that it happened for several reasons (“front page needed re-architecture, lessons to be learned from lower-level pages, priorities, and others”). He also told me that while he would have prefered to do the homepage first, it has not been an issue thanks to a mobile version of the homepage acting as a proxy where all mobile traffic gets redirected. Implementing a “responsive” approach beyond the homepage definitely requires some thinking, planning as well as a good command of the different RWD techniques This is why many of our RWD course students choose to work on this kind of pages with the help and guidance of our instructor. Yet, I’m sure that several institutions have rolled out this approach to their content pages as well. I would love to feature more examples in a future post. So, if YOU have – or know an institution that has – achieved RWD bliss (well, gone responsive beyond the homepage that is), would you do me a big favor and post a link to one of these RWD content pages? I will compile a list from which we can all benefit from. Thanks for your help! We never considered doing the home page separately from the rest of the site. There are a few sections which have not been converted to RWD yet because they were already using a separate set of theme code. The events site was a new site launched earlier this year so it was RWD from the start. It’s not perfect, but it’s an ‘everything’ approach rather than a ‘targeted site sections’ approach. So far the feedback has been largely positive. There are lots of pages with issues (non-responsive tables and pages/subsites with popup windows being the biggest issues), but the sales pitch to the community was ‘this will work much better for folks on phones, while not working any worse for folks on computers.’ That doesn’t sound compelling when I put it that frankly, but by and large the community agrees. Our site wide bounce rate dropped 20% at implementation of our responsive design, and that was not limited to mobile users. So either the new look caused people to stick around or the performance benefits for all users is to credit. Based on Google’s research into the effect of page speed and their decision to factor it into their search results, I’m pretty sure the performance bump is to credit. RWD helps all users. We rolled out a responsive design for our consumer health publication at the end of May and have been really pleased with the positive feedback we’ve received. The admissions site just went live a few weeks ago, and the interactive viewbook (www.bluffton.edu/valuable) was posted yesterday.